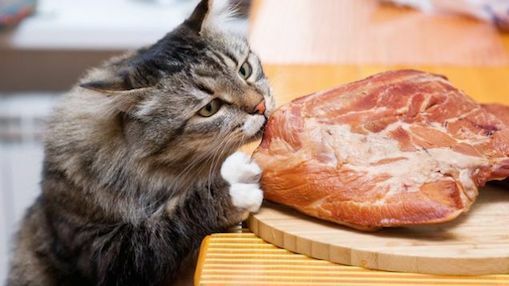 Most cat owners shy away from giving pork to their pets, the simple reason being that of all the meats this one may do the maximum harm. However, though this meat may not be the best option for your pet, it is probably not as bad as you think it to be. Giving it little amounts of cooked pork as an occasional treat would not cause harm to your kitty. Pigs release toxins since they do not sweat. This is untrue as they do sweat and toxin in mammals is mostly flushed out of their body by their liver and kidneys. Avoid giving your feline raw be it grounded into a paste or prepared into chops or sausages as it is often infected by the roundworm Trichinella spiralis, resulting in trichinosis. Cook the meat at a temperature of 130°F to kill the parasites. Providing it pork fat, as well as bones and ribs, are also a strict no-no as the former causes intestinal problems and the latter increases the risk of choking or digestive hazards since it might have splinters. Smoked or salted pork is also not recommended since it is high in sodium as well as other preservatives which are harmful to your cat. Pork liver is said to be a good source of Vitamin A, however giving it in excess amounts might result in vitamin A toxicity. Always cook the liver and never give it to your feline in its raw form. Avoid feeding your cat the pork skin because of its high-fat content. Pork can be harmful if eaten in excessive amounts since its high content of fat would hamper your cat’s overall health. If your pet shows symptoms of allergies after eating even a small amount of pork, then talk to the veterinarian at the earliest. If you still fear to add pork to its diet, then replace it with other food items like chicken and turkey which is low in fat but will make up for their protein requirements. Published on January 3rd 2018 by admin under . Article was last reviewed on 3rd January 2018.